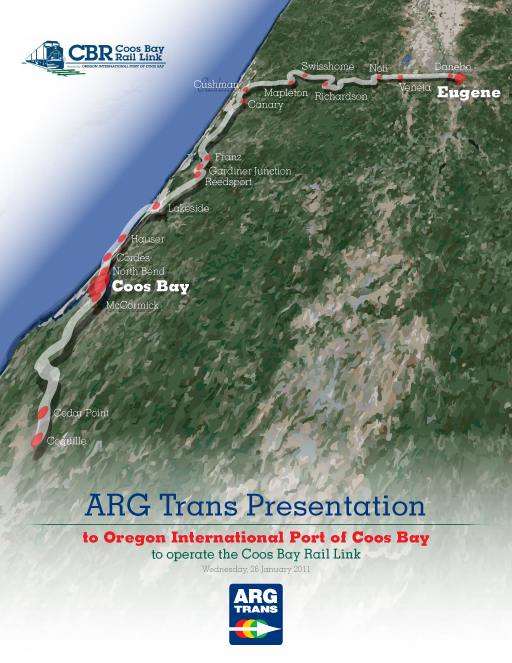 ARG Trans, already running a successful short line in Benson, Arizona, was asked to submit a proposal to restart the Coos Bay Rail Link [CBRL] on the coast of Oregon after 4+ years of sitting idle. 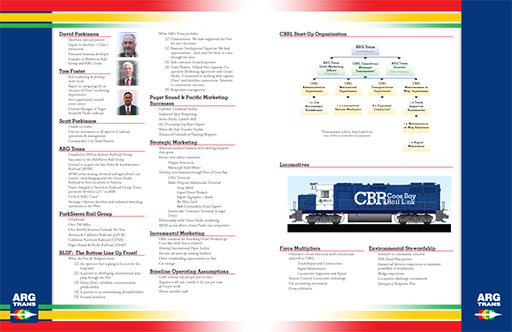 Being a bit of a railfan myself, helping design a proposal that would stand out and be more than a long list of information sounded great. Of course, the folks at ARG Trans put together a great proposal so my part was just making it look good in a very short amount of time. The initial proposal was a short one, followed by a much larger proposal with both projections and financial records for ARG Trans. 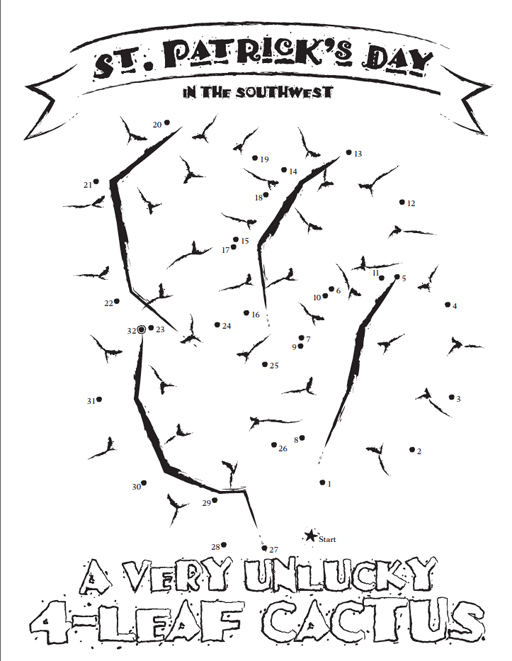 For the cover, even though the people of Coos Bay Rail Link knew exactly where the 133 miles of rail lay, an illustration of the route was a great solution. 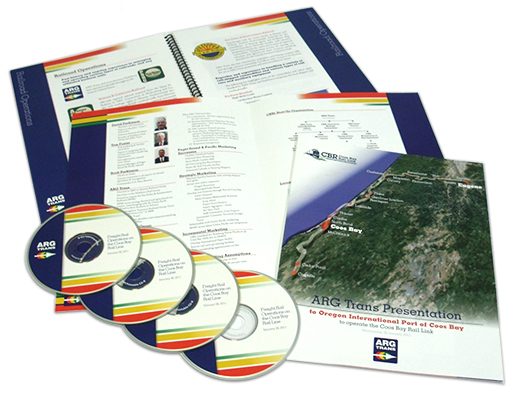 All the pieces worked together well, along with the proposals, slide presentations and documentation on a matching cd. 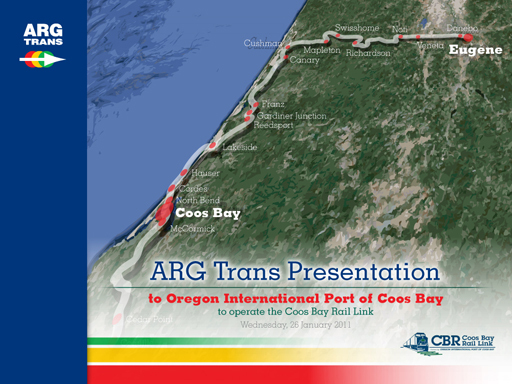 After a successful presentation by ARG Trans, they made the cut from five to two and in the end were selected as the Operator of CBRL – and against much larger operators as well. 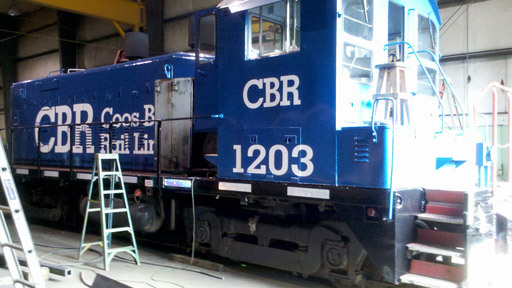 We had talked about creating a really cool paint scheme and a vehicle wrap as well [who wraps locomotives?] for the line but the timing to get service was tight — REALLY tight. 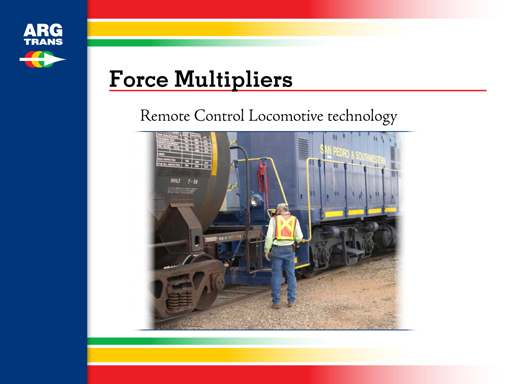 There would be less than 45 days to get locomotives purchased and repainted and running, but the reality was there was less time than that as the sooner they could get out on the line the better. 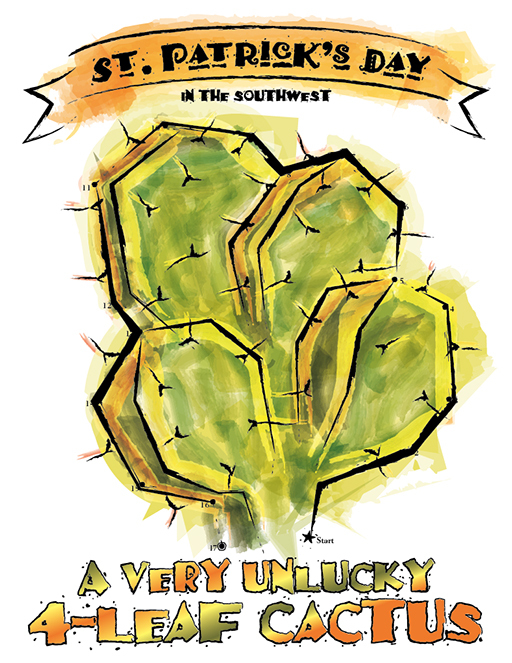 Some of the initial ideas were rather simple, though the dream was a full wrap of a imagery from the area. Forests, bridges, and the Pacific Ocean. Oh, it could be beautiful. Time to mock up a lot of simple ideas that can be quickly painted. 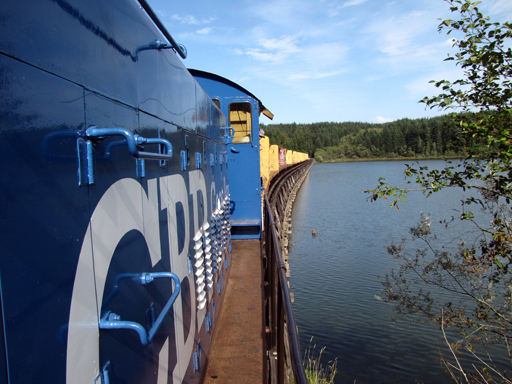 I passed the train this morning on my way to Eugene. 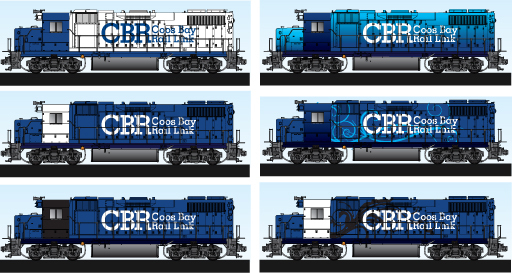 Even in the dark, the CBR locomotives are impressive. Whoever designed the paint job – the way the logo and colors are presented on the engines – did a great job. I look forward to treating Coos Bay to some amazing eye-candy some day. 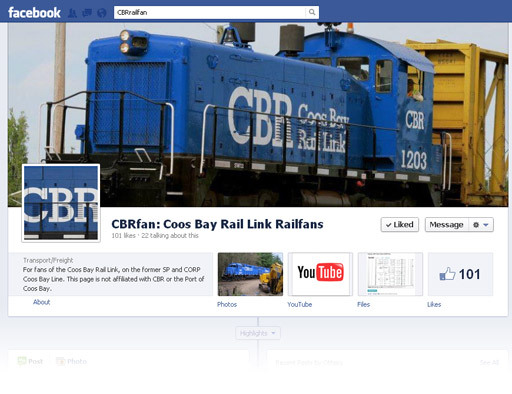 Until then, check out some of the photos from CBRrailfan on Facebook. I think you’ll agree, the train’s color scheme makes them pop out of the forest, and after seeing photos like the one above, I wouldn’t mind a leisurely ride on the line. Just gorgeous. I just had to color one for myself. Here is a free calendar from a photo of pavers I have been saving for a few years and had yet to find a use. Throw in some perspective via Illustrator’s perspective tools and now it is a hopscotch game that would not be all that easy to complete. 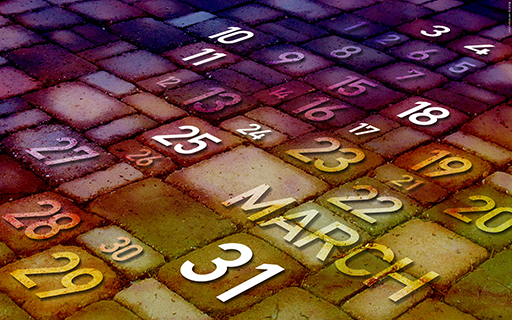 Click on the image below to get the full size image for your desktop.